I downloaded the nextissue app this weekend and I am obsessed! I have been catching up on all my favorite magazines and discovered a new favorite-- Domino! 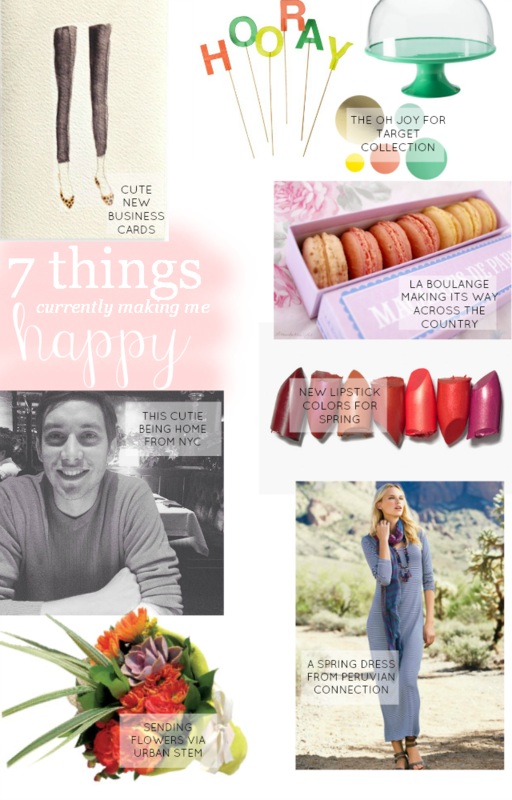 Feeling inspired by the 10 Things That Make Me Happy end of issue feature. I've rounded up some things that are currently making me very happy! -I ordered business cards from The Ateliar with the Lauren print and I am so excited for them to arrive! -Have you shopped the Oh Joy for Target collection? So stinking cute! I love the string lights, cake stand, and hooray cake topper! Sometimes the cause for celebration is just that you have a cake-- HOORAY is a very fitting topper. -La Boulange, one of my favorite little SF bakeries, partnered with (read: was bought by) Starbucks awhile back with the plan to bring their baked goods across the country. I saw a sign at my local Starbucks they were coming soon. SO HAPPY! -Warmer weather means bright new lipstick to play around with! -A new dress care of Peruvian Connection arrived in the mail this week. Happy mail day to me! -Urban Stems is taking DC by storm! How fun is sending surprise flowers! -Aaron's home from NYC! I can quit being a sap now! That cake stand is adorable. I might have to see what other colors they have!